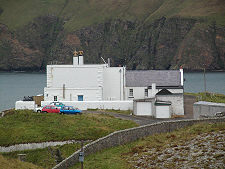 Unst is the most northerly inhabited island in Britain. It is very roughly rectangular in shape, and measures some 12 miles from north to south and 5 miles from east to west. The land area is just over 12,000 hectares, or a little under 30,000 acres, and the highest point is Saxa Vord, at 285m or 935ft. This lies close to the northern end of Unst and was for many years home to a military radar and early warning centre. 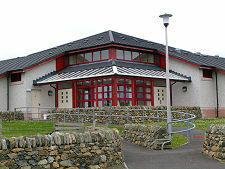 Until RAF Saxa Vord closed in 2005, the Ministry of Defence was the island's largest employer. 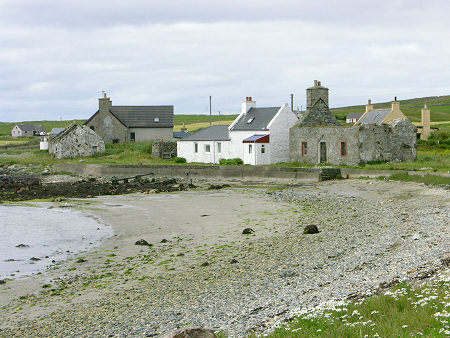 The population of Unst has diminished over the past century, but less quickly than on many Scottish islands. Its high point was 2,269 in 1871, while by 1991 it stood at 1,055. It had reduced further, to 720, by 2001; and to 632 by 2011. 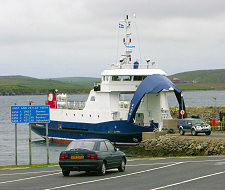 The ferry service that connects Unst to Yell (and via it to the Mainland of Shetland) and Fetlar runs from Belmont, at the south west tip of the island. There is also a daily bus service from Lerwick. The southern half and western side of Unst are both fairly uninhabited. 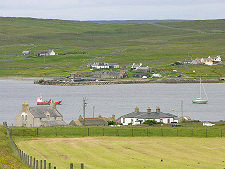 A string of small settlements lead from Belmont east along the south coast to Uyeasound and beyond it to the south eastern tip of Unst. This is overlooked by Muness Castle, by far the grandest building on the island, albeit now in ruins. A little north is the fine beach at Sandwick. The excellent main road from the ferry terminus leads north east as far as Baltasound, the scattered village "capital" of Unst. 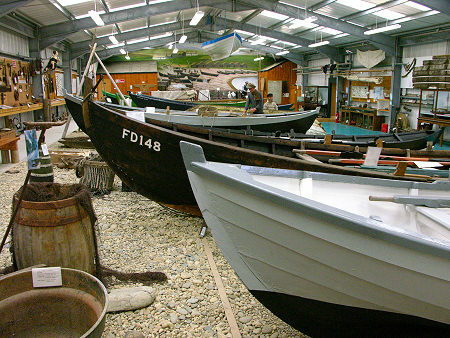 This is considerably less busy than it was a century ago at the height of the herring boom. But it remains home to many of Unst's services, including the leisure centre and school, the main harbour, and the airfield. 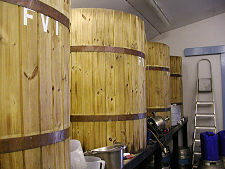 The Baltasound Hotel is Unst's only hotel (and Britain's most northerly), while the nearby Valhalla Brewery is, in turn, Britain's most northerly brewery. North again brings you to Haroldswick. The village is home to the mothballed military base, while Saxa Vord on the hilltop above above still carries its aerials and domes. 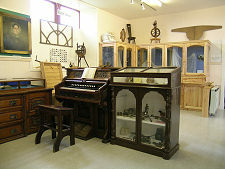 It is also home to Britain's most northerly church, plus the Unst Boat Haven and the Unst Heritage Centre. From Haroldswick you can follow roads north west towards the nature reserve, cliffs and sea birds at Hermaness, or north east towards Britain's most northerly house (and road) at Skaw: plus more spectacular coastal scenery. And the bus stop? 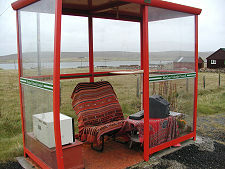 Shetland has more than one furnished bus stop: but only one comes with a microwave, computer and visitors' book. It can be found between Baltasound and Haroldswick.